Finding a quality puppy can be a daunting task. To find the right dog from a reputable breeder will take time and homework on your part. Remember, you are purchasing a member of the family that will hopefully be with you for the next 15 years. Great web-sites don't mean they breed great dogs. AKC registered isn't a sure ALL, but SKC and UKC is a sure NO. Ask to see health clearances in writing for both parents. The minimum health checks should include CERF eye exams and OFA hip ratings. Reputable breeders will always take a puppy back. Visit local dog shows and visit with area breeders. Ask questions and expect them to ask you many questions in return. The American Kennel Club offers several web-sites that offer great information for the puppy buyer. These web-sites will help you find the best possible family pet with the best chances of receiving the healthiest, happiest dog possible. It is important that you make smart informed decisions. 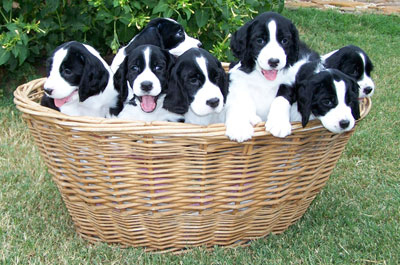 For more information on finding the right Springer Spaniel puppy click on Finding The Right Breeder Our parent club web-site is a great resource for someone looking for a Springer Puppy Remember, nothing is better than Puppy Breath from a new Springer baby.